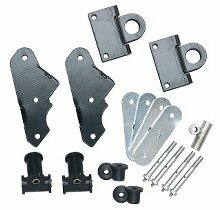 This shackle reverse kit improves your vehicles handling by allowing the front wheels to move back and up as the suspension compresses. The kit installs easily with little drilling and no welding. Front driveshaft modification may be required.